This is identical to the C AVJ42KB, but including an all steel locking cabinet with full piano hinges. 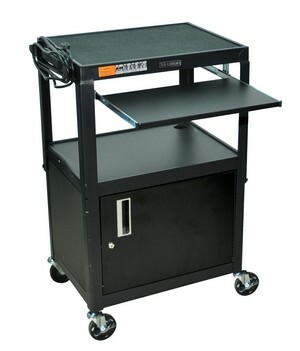 This is a narrow space-saving 24" wide sturdy steel mobile computer workstation with pull-out keyboard, designed to fit in small tight spaces. It is height adjustable in 2" increments, from 24" to 42", and includes hand holes for easy mobility. (NOTE: the CPU holder option has been discontinued). It is also available with optional bigger wheels. Please call for special configuration details. The C AVJ42 line is available in different configurations, such as above, with locked cabinet, or/and bigger wheels, 26" , 34" and 42" fixed heights, with or without keyboard tray, etc... Also, the width can be increased with foldable side shelves. * Includes 3-outlet, 15' UL and CSA electric assembly. * Rolls on large 4" casters, two with locking brakes. * Color: Cabinet version Black only. Open versions (C AVJ42KB: black, green, red, yellow, or blue). * Pull-out keyboard. Mouse tray is no longer available.